We arrived a week and a half ago and the team of Rick, Aaron, Rachel, Logan, Abigail, and Nathanael made a big impact on the Child Redeemed Mission Home and have returned to Charlotte, NC. I am here for another week or so. I need to catch up on updates but it has been a really nice trip. Over 1,000 pounds of supplies, donated clothes, and shoes brought. 4 teenagers engaged and had a great time with all the kids. Rachel and Logan visited Promise Primary 3 days, teaching and sharing. Repaired the merry go round, upgraded the electrical system, installed lights in the new guest house, and made many repairs. 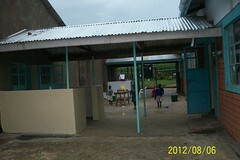 Installed gutters at the new Promise Primary school building and began the playground project. Built 40 desks and 6 tables for Promise Primary School. Shared and participated in worship and fellowship with the community.